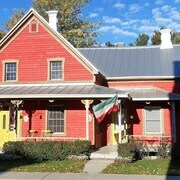 Situated in the historical district, this bed & breakfast is 16.4 mi (26.4 km) from Statera, The 104th Island. I liked the Nespresso machine, wine glasses in the room, spacious room however the bathroom was extremely small, old jet spa bathtub (could have been converted to just a walk-in shower and no laminated flooring that I was expecting to have because some rooms don't have carpet. Bar and food was very good and not pricey. Quiet also. Where to find Sorel-Tracy hotels near an airport? 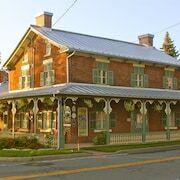 Where can I find hotels in Sorel-Tracy that are near tourist attractions? 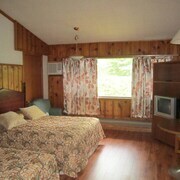 For those travelers searching for accommodation options near Sorel-Tracy, there are a few places from which to choose. 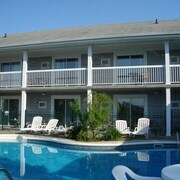 Within easy driving distance of the downtown area, you can find 4 Expedia-listed apartments and hotels. Expedia-listed hotels that are within driving distance of Sorel-Tracy include the Days Inn - Berthierville and Motel Tracy. The Seigneurie de l'ÃŽle Ronde is located 30 kilometres (19 miles) away from the main part of Sorel-Tracy. 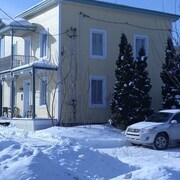 Another option is the GÃ®te champÃªtre Au Tournenvert, which can be found 20 kilometres (12 miles) away. Two other hotel options in the area are the Le 100 St-Laurent and the Motel Normandie. While you are here in Sorel-Tracy, try and leave enough time to check out more of Montreal - Monteregie. Montreal - Monteregie is marked by forests, and common Montreal - Monteregie tourist sights include old towns and churches. Locals and visitors alike in this part of Canada commonly enjoy skiing, cross-country skiing and ice skating. Repentigny is 40 kilometres (25 miles) to the southwest of Sorel-Tracy, and is where you'll find the Galeries Rive Nord and the Galerie Art 543. 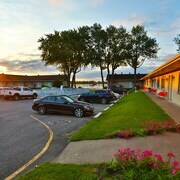 Should you wish to stay in Repentigny, check out the Motel Capri & Suites and Au Doc Motel. Alternatively, you could consider staying in Drummondville, 45 kilometres (28 miles) to the east of Sorel-Tracy, where you'll find the Best Western Plus Hotel Universel Drummondville and Quality Suites Drummondville. While in Drummondville, don't miss Popular Photography Museum and the Drummondville Golf and Curling Club. 65 kilometres (40 miles) to the southwest of Sorel-Tracy is Longueuil, a regional center with a population of 230,000, home to great places to see like the Place Longueuil, Parc Michel Chartrand and Centre Jacques Cartier. The Pi-o Centre d'Amusement and Parc Marie-Victorin are also well worth checking out. 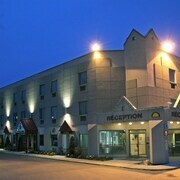 The Holiday Inn Montreal Longueuil and HÃ´tel Le Dauphin MontrÃ©al - Longueuil are a selection of the places to stay in Longueuil. Situated 80 kilometres (50 miles) away from Sorel-Tracy is Pierre Elliott Trudeau International Airport. 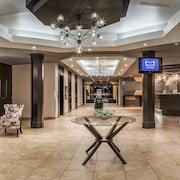 Stay nearby at Montreal Airport Marriott In-Terminal Hotel or Hampton Inn & Suites by Hilton Montreal-Dorval. What are the most popular Sorel-Tracy hotels? Just 30 Mins From Montreal: Waterfront Sun-drenched Home With spa and Sauna! Are there hotels in other cities near Sorel-Tracy? 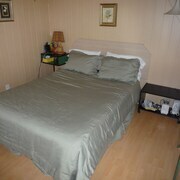 What other types of accommodations are available in Sorel-Tracy? Explore Sorel-Tracy with Expedia.ca’s Travel Guides to find the best flights, cars, holiday packages and more!